Here’s a story of a photograph I took in Plaza de Sant Felip Neri, a small plaza hidden among a tangle of alleyways in Barcelona. I was wandering aimlessly through Barcelona’s gothic quarter in early 2011. I had my camera in hand and was simply exploring this gorgeous city. 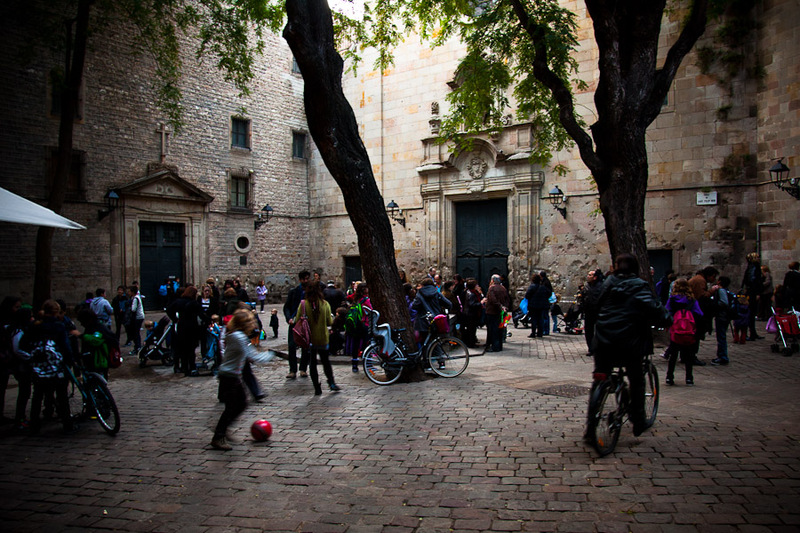 I had been walking through a maze of mainly-deserted alleys for perhaps half an hour, and the alley I was in abruptly opened out into a gorgeous little square full of children playing. It seemed clear there was a school in one of the adjacent buildings which had just finished. Of course I couldn’t resist taking a couple of photos. The fantastic light, the wonderful stone textures, the architecture, the obvious history of the place and then the vibrant colour and movement of the children. I didn’t know or think any more of it at the time. I didn’t even know the name of the plaza. It was simply a photogenic scene I had fortunately stumbled across. After all, the little square seemed so modest and innocuous. It wasn’t until months later that I noticed the textures on the walls behind the children resembled bullet-holes. Obviously there was a story here, but I didn’t have a name or any way of knowing where it was. Then later I looked closer and realized that on the right-hand side of the photograph is a small plaque that has the name of the plaza on it! Plaza de Sant Felip Neri. With the help of Mr Google, I soon filled in the back-story. This off-handed snapshot now has a whole lot more meaning to me. “This square was built on the grounds of a cemetery and the church on it was built in 1752. Look at the walls..they tells us now the awful tragic past of this little square in the heart of Barcelonas Gothic Quarter. 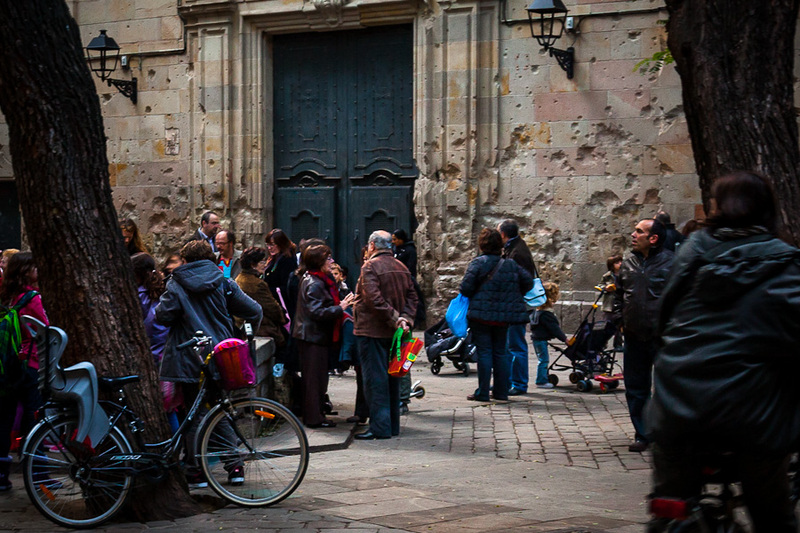 Some people still tell that the holes in the stones of the church were from the bullets of Anarchist execution squads, who had shot priests standing against the wall of the church. Look up there.. can you see the holes halfway up the church? How bad was this squad in shooting? Although there still seems to be some uncertainty about the true story, all the internet sources I read pretty much agree that the bomb coverup is the most likely explanation. Looking at this photograph now gives me chills. As wonderful as it is to see so many children playing in a square like this and it’s great to see traditions live on despite tragedy, I can’t help but imagine that this is exactly the kind of scene that may have been present in this square the day that bomb detonated.